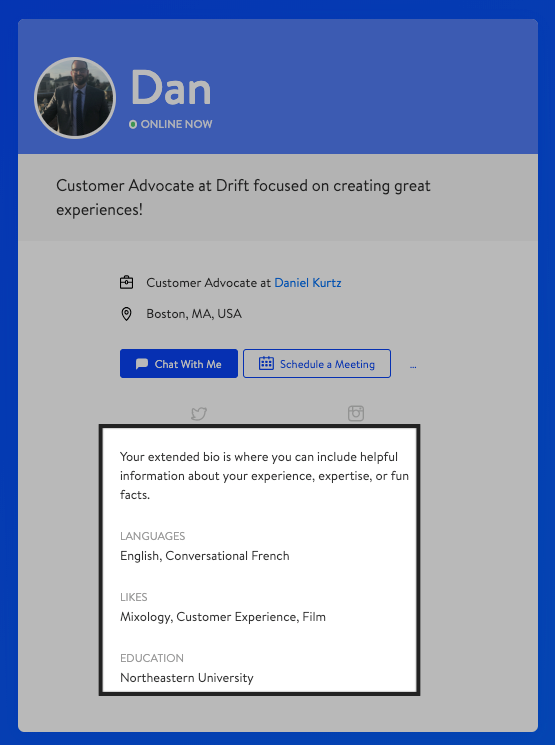 Your Drift Profile is a great place for your customers to chat and book meetings directly with you. It's also a great place for them to get to know you! In this doc, we'll go over the basics of setting up and sharing your personal profile. You can located your personal profile by going to Settings > My Settings > My Profile or by clicking here. This is the unique link that will lead to your profile. We recommend making this short and personalized! We also recommend setting this once and not changing it. If you've shared your profile link and then you change it, the old link will break! 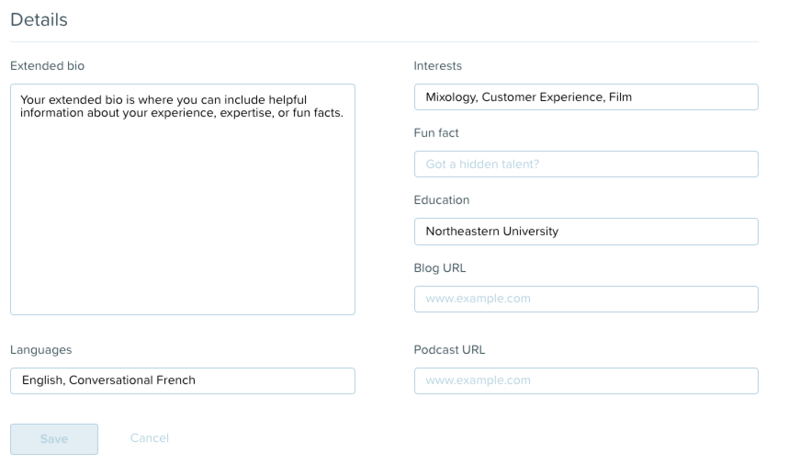 Fill in the the Title, Location, and Short bio fields accordingly with information about your position and interests! To make your profile public, switch on the toggle! You have two options for the theme of your profile. On the left, one that is based on a card, and on the right, one that puts your avatar front and center in a two-column style! 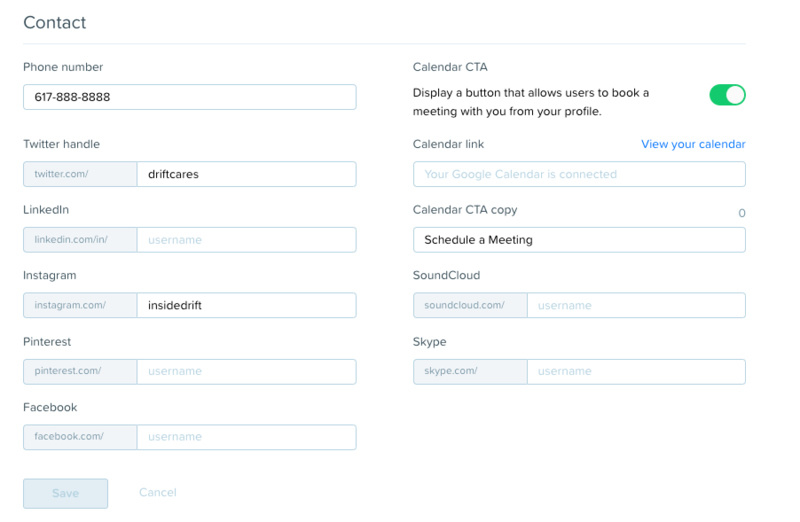 The contact section contains fields for your phone number, your profile's calendar CTA and your social media links! 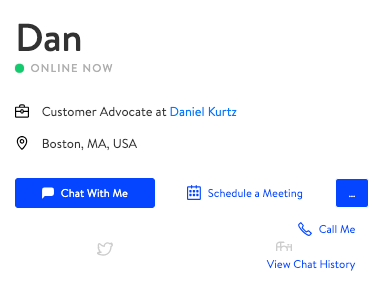 If you enter your phone number you'll see an ellipsis on your profile with an extra option for your visitors and customers to give you a call! 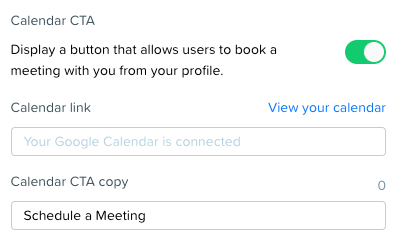 For the calendar options, toggle the switch on to display a button that will fire a meeting scheduler Playbook and use the Calendar CTA copy to customize what the button says! The Default Greeting is what shows when a visitor your profile clicks the widget or your "Chat With Me" button. 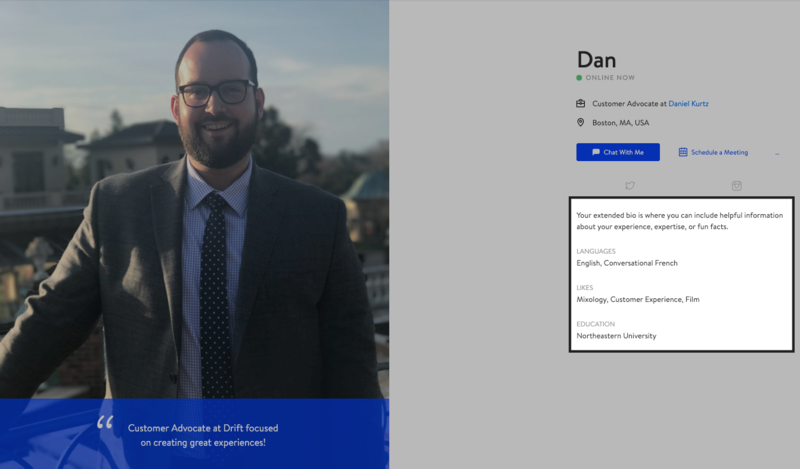 Whether the online or offline message is shown is based on your Drift account's online/offline status and NOT by your individual agent availability. The Details section is where you can input a longer bio and other information such as education, personal interests, and your blog link! Whenever you're ready to make your profile public, switch on the toggle within the My Profile section. 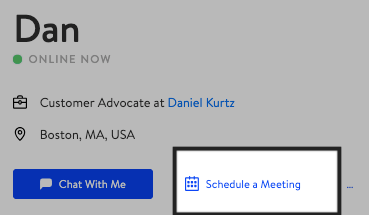 The status indicator located under your name is dependent on your individual agent availability and not on your organization's online/offline status. 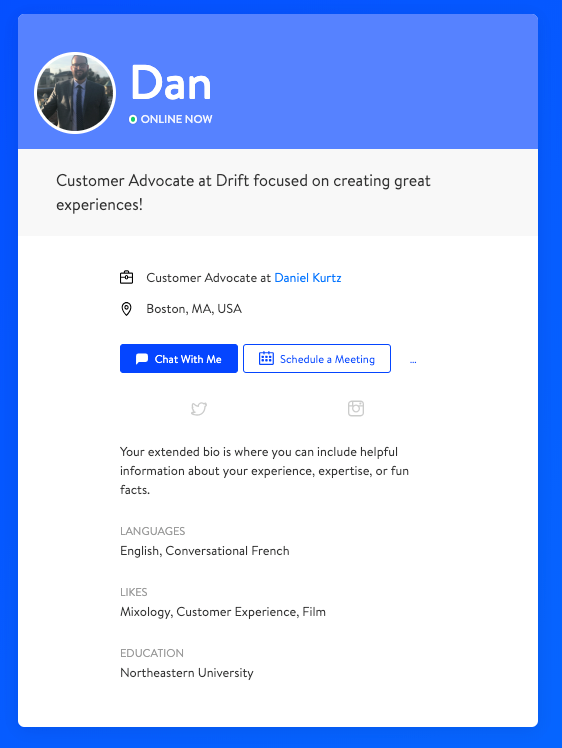 You can change your individual availability by clicking your avatar in the bottom left corner of your Drift account! For more on managing your organization's targeted business hours, go to Settings > App Settings > Drift Widget > Hours and Targeting or click here. If you prefer video content, check out this video on customizing your profile! If you have any questions about your profile, talk to us! Just click the widget within your Drift account!